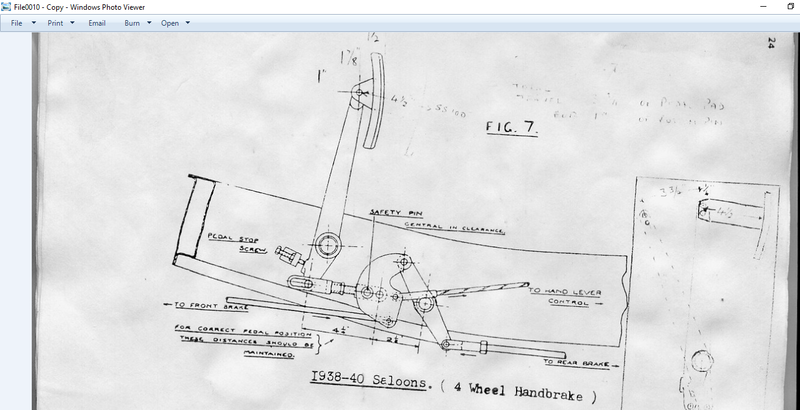 Would anyone have a diagram or details of how to set up the brake pedal area of a prewar SS 2 1/2. I have attached a photo of the area in question. Not the same as the later Mk IV. If you PM me your email address I’ll send you an article. Apparently similar but not quite the same as early '38 parts. They seem to have tried several different operating designs around this time before finally getting to the Mark IV layout. Nice photo’s from the brake pedal parts, do you may be also have some photo’s from the handbrake parts ? p.s. The handbrake lever shaft is not really at an angle. It just looks like that because I was distorting the image to make a full under side collage with it. Here is the early '38 handbrake linkage. Yes my set up looks very similar to that. Interesting to note on your photo that the brake rod heading forward to the pedal assembly is positioned in the lower of the two holes in that lever. I will change mine accordingly. However my brake assembly arrangement does not seem to have the same dimensions as the diagrams I received. There is a 2 1/2" dimension shown that just would not be possible on my car. 1 1/2" is possible. I see your rod going forward is bent. I don’t think it should be. Mine isn’t. Although I found bent rods on both axles. All 4 of them going from the bell cranks to the wheels. Makes me wonder if this car did some cross country rock climbing. Not sure if it should be or not but looks a fairly well formed bend. Also the one from the handbrake forward appears to also have the same bend set in it. I haven’t seen a set up quite the same yet. I am suspicious of any bend in a brake rod and suspect it is caused by some form of past bad handling. Because all brake rods only operate in tension, any bend will try to straighten when brake force is applied. Therefore some of this force is lost as the rod tries to straighten, causing an unequal force through its pairing rod at the brake shoe expander end. This can be either to the opposing wheel or front to rear. The rod will never re-straighten due to pedal force as this force can never take the bend back past yield point, so the bend in the rod just springs back. Front brake rods on SS100 seem to have a small bend, But they have smaller 13"brakes , so the rod is closer to the axle. I’d take a punt this would also apply to 1936 saloons and tourers too. They are only very small bends and it appears the force of one’s leg isn’t enough to straighten them. Hi Ed. I checked with Simon W and he does not have any of the clevis pin specials, so I will have to make them or hope for some leftovers from your contact’s batch job. There is one quality about these pins - they do last a very long time. If you can help, I would appreciate it. Wasn’t till reading this thread, I knew these cars had mechanical brakes! There is one quality about these pins - they do last a very long time. If you can help, I would appreciate it. Ian is digging them out. Pre-war Rolls-Royces had astonishingly good mech. brakes, with their ingenious servo system. My ‘rent’s 6600 pound PIII with 18” drums, would bring that car to an amazingly quick stop! Well. I came to fit my spare wheel tray and the brake linkages get in the way and I couldn’t get the tray fully in so I have had to turn them around on the pedestal. So much for my idea. The top photo is where the linkages will now be fitted after I got the spare wheel tray in. You will need to rotate the bell crank by 180 degrees and move your rod from the pedal to the other side of the compensator. Just found this for the 40SS and 46 1 1/2.